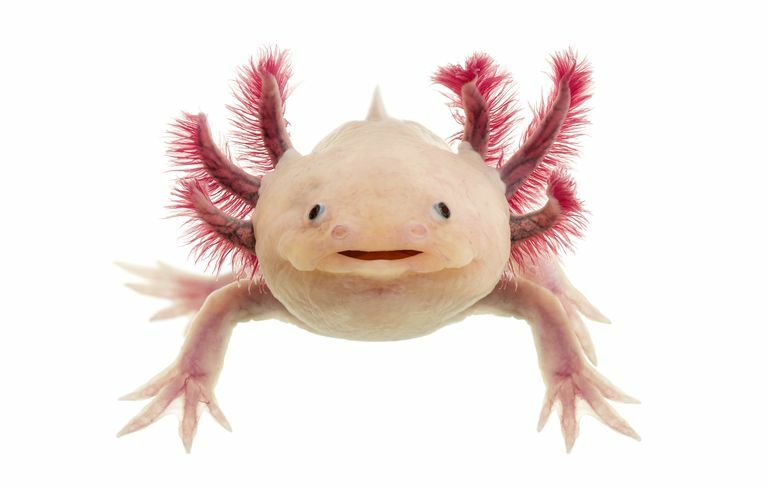 According to Aztec legend, the first axolotl (pronounced axo-LO-tuhl) was a god who changed his form in order to escape being sacrificed. The sneaky transformation from terrestrial salamander to a fully aquatic form did not save later generations from death. The Aztecs ate axolotls. Back when the animals were common, you could buy them as food in Mexican markets. Much of what we know about axolotl reproduction comes from observing them in captivity. Captive axolotls become mature in their larval stage between 6 and 12 months of age. Females typically mature later than males. The increasing temperature and light of spring signal the start of the axolotl breeding season. Males expel spermatophores into the water and try to lure a female over them. The female picks up the sperm packet with her cloaca, leading to internal fertilization. Females release between 400 and 1000 eggs during spawning. She lays each egg individually, attaching it to a plant or rock. A female may breed several times during a season.